Fairy Tales and Sagas | Brüder Grimm-Gesellschaft Kassel e.V. The “Children’s and Household Tales” by the Brothers Grimm are the classical collection of fairy tales in world literature. They are also the worldwide most read and widest-spread book of German cultural history, which has been translated into more than 160 languages and dialects all over the world. In the Ancient World, elements of tales and fairy tales are present in the most diverse literary disguises, already. Famous is, for example, the Latin narrative about “Amor and Psyche” by Apelius from the second century or the Indian book of fables “Panchatantra- Five Wise Lessons” from the third and fourth century. In the Middle Ages, the collection of anecdotes of the “Gesta Romaorum” (The Deeds of the Romans) is of great value for the handing down of traditional narratives. Independent genre specific fairy tale texts crystallize later, though. Particularly marking for Europe are the great Oriental and Romantic collections. The written recording, the “writing down” of orally handed-down narratives, depends on the movements of the respective epoch, though. Thus fairy-tales, legends, tales and other traditional literature must be read and evaluated from the era specific, aesthetic viewpoint. This becomes obvious, for example, in the baroquely stylized narratives by Gianfranco Straparola and Giambattista Basile from the 16th and 17th century as well as in the gallant and often ironically retold so called “Conte des feés” by Charles Perrault, Marie Cathérine d’Aulnoy and other salon poets of the early late 17th and 18th century of French literature. Even though their fairy tales were probably derived from traditional sources. When it comes to motifs and themes, the language they used shows the elegant narrative style of the art tales of their era. Prior to this, fairy tale books were published in Germany, too. The French “Conte des feés” as well the Oriental fairy tales of the great collections of “1001 Arabian Nights“ “1001 Day” and others, which were primarily imparted in France, as well, were spread in German translations. At the same time, fairy tale themes were artistically taken up and literarily processed as by Christoph Martin Wieland or Johann Heinrich Jung-Stilling. From 1782 until 1787 Johann Carl August Musäus, a grammar school professor, edited his “German Fairy Tales” in five volumes and also Benedikte Naubert, a pulp fiction author, published her “New German Fairy Tales” in five volumes in Leipzig from 1789 until 1793. Characteristic of both of them as well as of other numerous collections named “Nursery Rhymes”, “Children’s Tales” or “Winter Tales” is the mixture of elements of fairy tales, tales and legends with constituents of domestic and foreign literature of that epoch. Inspired by the role model of the “Poems of Ossian” by the Scottish author James Macpherson, whose literature was considered liberal, wild and vivid and influenced by the debate about the relation between folk- and art literature, which was mainly unleashed by Johann Gottfried Herder, fairy tales, tales and folk songs became increasingly popular with writers at the end of the 18th and the beginning of the 19th century. “There is no doubt that literature and the song in particular was all ethnic in the beginning. It lived in the ear of the people and on the lips of the harp of vivid singers: They sang about history, events, secrets, miracles and signs: It was the flower of the uniqueness of the people, its language and its country, its music and soul” wrote Herder in the preface of his two volumed “Volkslieder”, which were published in Leipzig from 1778- 1779. Above all, the Romantics – with their explicit emphasis on the wonderful, the supernatural and the conscious transcendence of causalities and experiences of reality- they turned to the subject of fairy tales. They not only redesigned traditional fairy tale themes and worked them into their literature, they also created an artistically composed new style of fairy tale literature. “The genuine fairy tale has to be a prophetic presentation and the genuine author of the fairy tales a seer of the future”, Novalis wrote in a letter to Friedrich Schlegel in 1800. Apart from Novalis, whose novel “Heinrich von Ofterdingen” was supposed to gradually turn into a fairy tale, above all Ludwig Tieck, Carl Wilhelm Contessa, Friedrich de la Motte- Fouqué und ETA Hoffmann played an important role at the time fairy tales became en vogue. From the Heidelberg Romantics ranking with Achim von Arnim and Clemens Brentano, a direct path leads to the brothers Jacob and Wilhelm Grimm and to their collection of the “Children’s and Household Tales”. “Maybe this was the right time to record these fairy tales, as those who are meant to keep them become fewer and fewer“, - is said in the preface to the fairy tales of the Brothers Grimm in 1812. 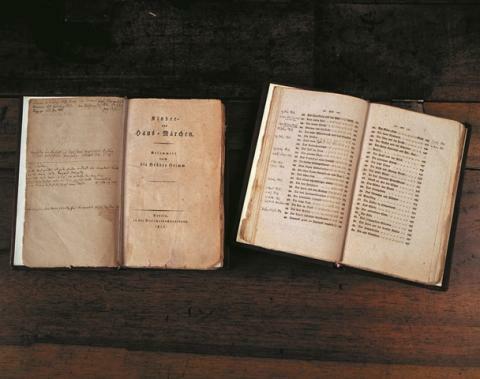 Jacob and Wilhelm Grimm gathered more than 200 texts- based on oral as well as written information, mainly in Kassel. Memories and experiences of their own childhood hardly had any influence on the Grimm’s collection of fairy tales and legends. They received the impulse that caused them to deal with folk tales in Marburg during their academic years. Here, the Grimm Brothers came to know Clemens Brentano, a brother in law of their teacher and law historian Carl von Savigny. It was Brentano who familiarized them with the intentions of the second phase of German Romanticism, the so-called “Heidelberg Romanticism”. The Brothers Grimm did not only travel across the country collecting fairy tales and legends. The role commoners played as a source is not very important, either. They were rather supported by more than 50 contributors, who mostly came from Hesse and Westphalia and made contributions to their fairy tales. These people were mostly young and had a well-educated and well-off background like the Grimms, too. So, the bourgeois families Wild and Hassenpflug in Kassel told many fairy tales the Brothers Grimm. A priest’s daughter, Friederike Mannel, and a priest candidate Ferdinand Siebert delivered important further texts to them from the Swalm. Baron v. Haxthausen and the sisters Annette and Jenny v. Droste-Hülshoff made significant contributions from Westphalia. Only the tailor Dorothea Viehmann, a proprietor’s daughter from the village of Zwehr’n nearby Kassel, came close to the image of a folksy fairy-tale teller. Moreover, the Brothers Grimm (and partly also their informants) retrieved their information from written sources, medieval poetic novellas legends, farces, books of anecdotes, collections of animal fables, miraculous sign books and literary works from the 17th and 18th century. If we pay attention to the Grimm’s textual design, there is no verbatim recording of the oral traditions to be found in a modern sense. Jacob and Wilhelm Grimm stylistically edited their texts in order to transform them to their ideal texts conception of the folk tales. The cultural categorization of the Grimm’s fairy tales in Hesse and Germany must also be taken into consideration. “In these folk tales lies the very German myth, who seemed to be forgotten”, the preface to the second volume of the “Children’s and Household Tales”(1815) says. At the same place, one can read about the genuine Hessian fairy tales by Dorothea Viehmann and the purely German origin of the fairy tales. eir origins and the relation between art- and folk literature until today, but have not come to a satisfactory conclusion so far.